Coco Rocha, wearing Diane Von Furstenberg, and Diane at the Exhibition Opening Celebration on January 10, 2014. Diane von Furstenberg kicked off the 40th anniversary of her iconic wrap dress with a star-studded event for the opening of her Journey of a Dress Exhibition in LA. Hosts Andy Cohen and Coco Rocha reported live from the red carpet at the historic Wilshire May Company Building to capture the glamorous evening, as notables from the fashion, art and entertainment industry came out to celebrate the designer and the iconic dress that started it all. 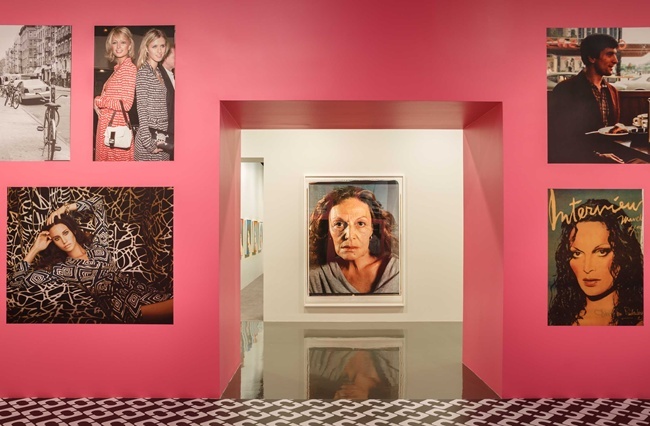 The exhibition includes portraits of designer, muse, and collector Diane von Furstenberg by celebrated artists such as Andy Warhol, Barbara Kruger, Chuck Close, Francesco Clemente, Helmut Newton, and Annie Leibovitz. The work of Anh Duong, Zhang Huan and Li Songsong is also featured, as well as that of other contemporary artists. In A Ghost May Come—a stunning new piece from Dustin Yellin—the likeness of a wrap dress is suspended in glass, while colorful illustrations from Antonio, Ruben Toledo and Konstantin Kakanias strike a more playful tone. 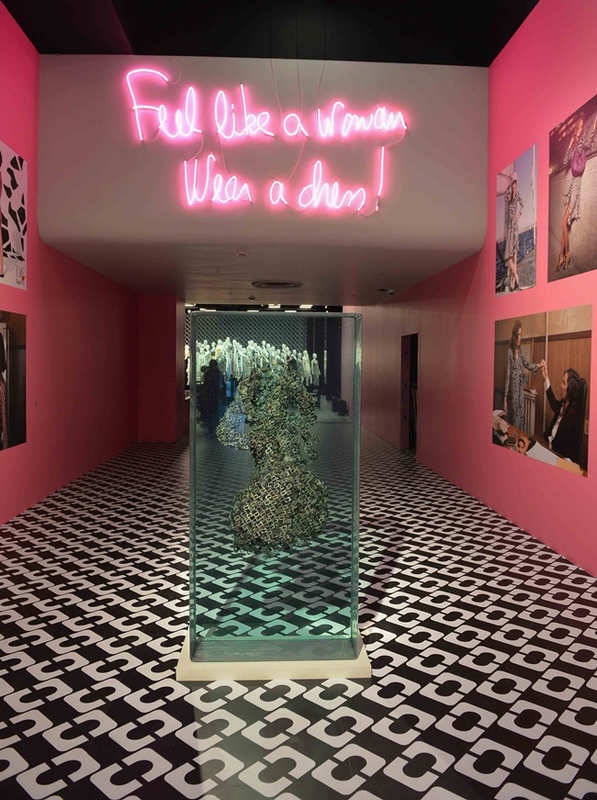 The exhibition also includes stills from the wrap dress’ big screen cameos, from Cybill Shepherd in Taxi Driver to Amy Adams in American Hustle. Gwyneth Paltrow, wearing Diane Von Furstenberg, and Diane. 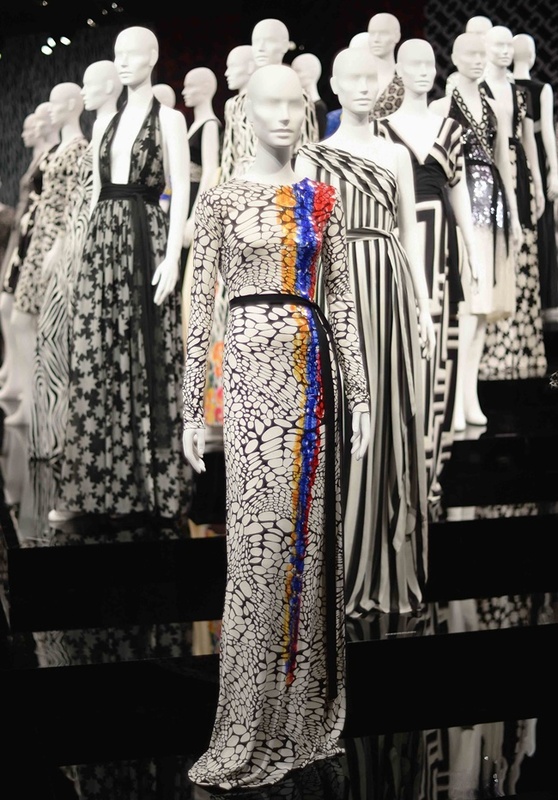 In a year that marks the 40th anniversary of the wrap dress, the exhibition focuses on a retrospective of vintage and contemporary DVF wraps, with a timeline chronicling the journey of the iconic dress—from the first sample to a world-renowned symbol of power and freedom for entire generations of women. Limited Edition anniversary dresses created for the exhibition are also on display. Diane and Demi Moore, wearing Diane Von Furstenberg. DVF will be celebrating throughout 2014, kicking off with a Limited Edition Collection created in collaboration with The Andy Warhol Foundation. It is also inviting women all over the world to become a part of the journey by submitting their personal wrap stories and photos at dvfwrapstory.com. Photos by Stefanie Keenan & Michael Buckner/Getty Images for Diane Von Furstenberg. The exhibition is housed in the historic Wilshire May Company Building, the former home of the famous May Co department store and the future Academy Museum of Motion Pictures. The exhibition is open to the public and runs from January 11, 2014 through April 2014. How cool! I wish I could go! Great post! I am planing a visit next week... so excited!! !